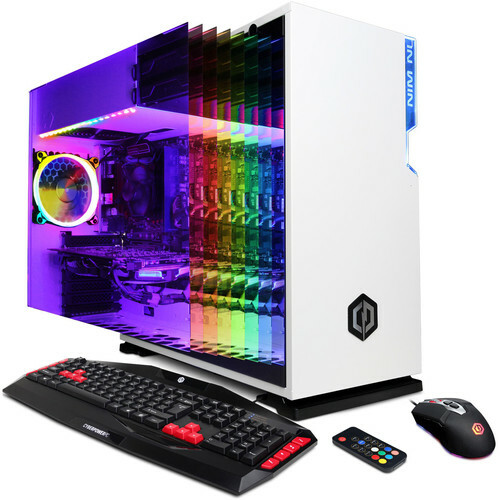 The Gamer Xtreme Desktop Computer from CyberPowerPC is built with gaming performance and the aesthetics to match. Specs-wise, it's powered by a 3.6 GHz Intel Core i7-9700K eight-core processor, 8GB of DDR4 RAM, and an NVIDIA GeForce RTX 2060 graphics card. For storage, it has a 240GB SSD paired with a 2TB 7200 rpm HDD. To improve this system's performance and storage capabilities, you can install additional RAM, up to 64GB, as well as extra storage drives. Other integrated features include 802.11ac Wi-Fi, Gigabit Ethernet, DVI, HDMI, and DisplayPort outputs, and multiple USB ports. The operating system installed is Windows 10 Home, and it comes with a USB keyboard and mouse so you can get started as soon as possible. This system is housed in a In Win 101 mid-tower case, which features a tempered-glass side panel, custom RGB lighting, and a 600W power supply. Included are a USB gaming keyboard and mouse so you can start gaming as soon as you set up your computer. All you need is a monitor (sold separately).